Construction at IRONWORKS is well on its way and it’s exciting to see the extensive progress since we last checked in. With man hours and months passing us by, our IRONWORKS site is rapidly transforming into the complete mixed-use built form vision we have been anticipating. IRONWORKS will be opening its doors to an estimated 35 businesses and 500 permanent jobs in the Grandview Woodland community in which we fill a full city block, providing ownership opportunities for small and mid-sized local businesses. 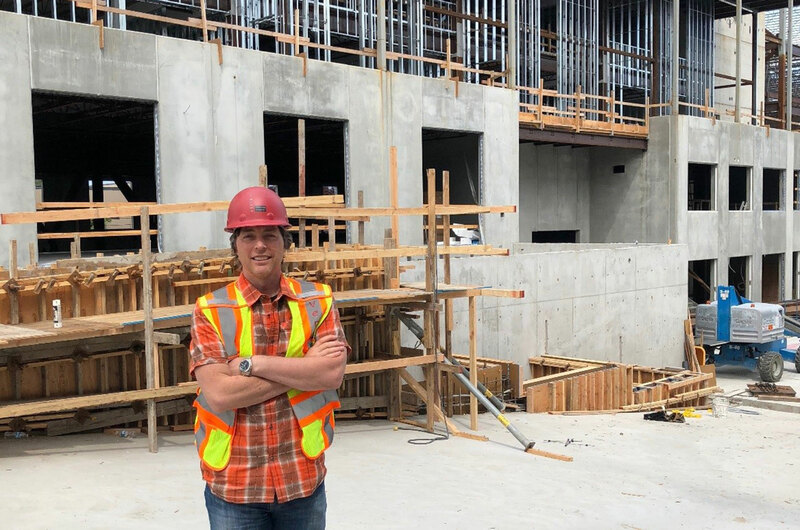 With Ventana Construction working diligently on site to make IRONWORKS a reality, we met with project manager Steve Craig to get the latest scoop on what’s been going on and what we can expect to see at IRONWORKS this summer. As a project manager at Ventana Construction, can you tell us a little bit about yourself and the work you do? I have been a project manager with Ventana for seven years. I’d say my job consists of making sure everything is available for the superintendent to keep the project running. My role is to ensure that all documents are in place i.e. contracts, drawings, site instructions, and contract records. I also coordinate any tenant improvements as it relates to the shell space and work with the city. My job is essentially facilitating the bridge between consultants and the design side of things with the construction end. How has working on the IRONWORKS development been? It has been a good experience! It’s not often you get a unique project like this. How would you say IRONWORKS has differed from other projects you have worked on? Its complexity. It’s quite an intricate building in that there are a variety of different construction methods that go into putting it together, such as the pre-cast concrete slab walls and beams together with cast in place concrete and structural steel. Working with these in the way IRONWORKS is designed makes it a technically challenging project. What does it take to complete a project like this? Perseverance! That is what it takes. You need to enjoy what you are doing, you need to be engaged in the process and the project. It’s easy to do with a project like this as it always keeps you thinking. What has been going on here? Fill us in! As for the northern building, “Pandora”, pre-cast wall slabs have been fully erected as of May 4th. The next step is completion of the structural steel elements which are expected to be complete by the end of this month. 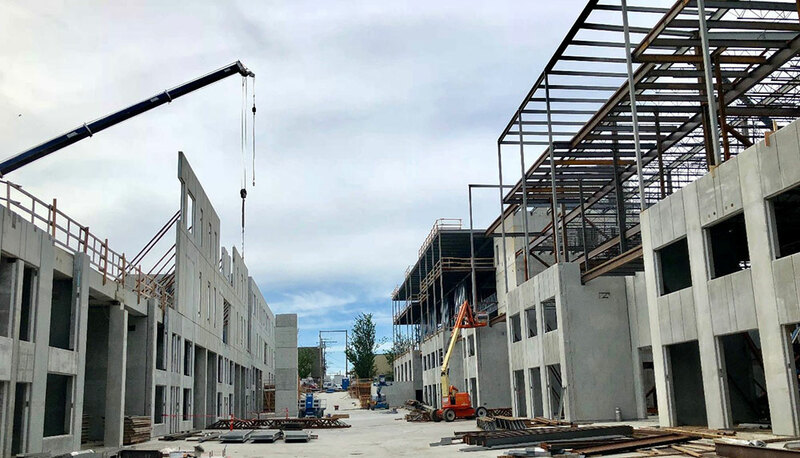 To learn more about the process and creation of our pre-cast walls, check out our construction update from February 5th. How about the Franklin building? The pre-cast wall panels will be complete within the next two weeks there. Once those are complete we will start with the steel structure, the steel stud exterior walls, and the roofing. The mechanical and electrical will also be forging ahead. Can you tell me a little more about these structural steel elements? Sure. The steel and the way it is incorporated is slightly different than normal. It’s proven to be a challenge working with the steel structure interfacing with the pre-cast wall panels. You need to be particular with how these go together. With the Pandora building especially, the steel itself is not the unique part, it is making sure it is accurately detailed and installed along with the pre-cast wall slabs. The Franklin building is less of a challenge to work with as its more of a traditional tilt up straight forward construction, although the pre-cast wall panels are stacked. Sounds like a lot is going on! What can we look out for next at IRONWORKS this summer? This summer you can expect to see windows being installed, roofing, and cladding panels. Once these come together, it’s really going to start to look like an actual building rather than just a frame. Thank you Steve, looking forward to it! The IRONWORKS built form provides flex-use office, warehouse, and industrial spaces for businesses that are looking for a flexible working environment to grow with their company’s future. Contact us and book a viewing today to learn more about the unique features at IRONWORKS.